The Master’s in Sustainable Development Practice (MDP) is a two-year degree providing graduate-level students with the skills and knowledge required to better identify and address the global challenges of sustainable development, such as UN activity, population, environmental problems, conservation, climate change, and energy branch. The program is implemented on the basis of Al-Farabi Kazakh National University on the UNESCO Chair on Sustainable Development of the Faculty of Geography and Environmental Sciences, developed for the training of young specialists who are able to become leaders of the XXI century in Kazakhstan and in the international arena. Leading educators, researchers and policy-practitioners preparing students to develop leadership skills, systematic analytical thinking and high-quality managerial expertise, emphasizing the competencies required by the complex development of the rapidly globalizing world. International collaboration with the best USA and European universities will help to students to develop the complex knowledge of world’s processes. The Curriculum has been formulated, conceptualized and assessed by the International Board of Advisors with contribution from the MDP global network partner institutions from around the world. Practical field experience and expertise development are offered as a part of learning experience through case studies or capstone projects. This includes work on local, regional, national and international projects. The students have a choice of being involved in case studies and capstone projects on an individual basis or as team-based groups. Some projects are completed by joint teams from two or more institutions in the MDP network. Master students have an option to spend an entire semester at an MDP partner institution taking course-credits towards an MDP degree. 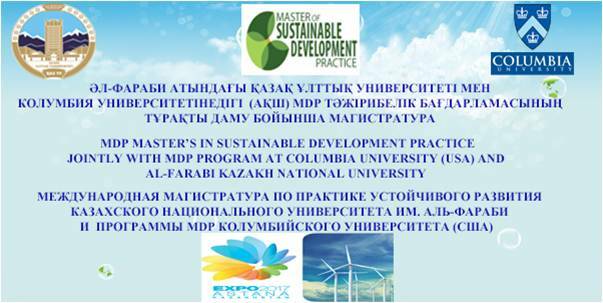 Admission to the MDP Master’s in Sustainable Development Practice at Al Farabi KazNU is competitive, based on academic excellence and professional interests and experience. Applicants must have completed a bachelor’s degree program at an accredited institution. All students will be required to show proficiency in the English language. Students who have completed a bachelor’s degree at a non-English language institution will be required to take the IELTS, TOEFL or equivalent.